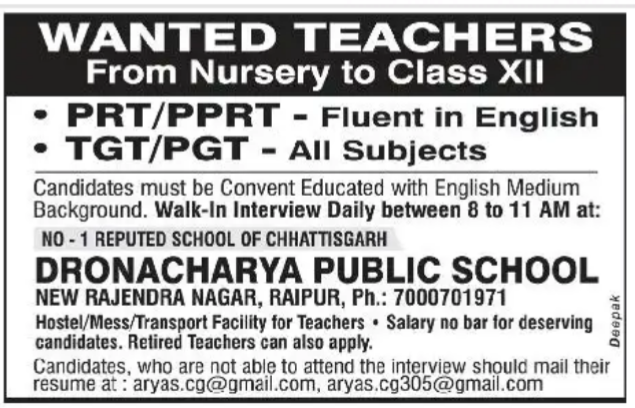 Dronacharya Public School, Raipur has advertised in THE Samaja newspaper for recruitment of PRT/TGT/PGT jobs vacancies. Interested and eligible job aspirants are requested to walkin daily.Check out further more details below. About School: Our aim is to encourage pupils to learn within a secure, friendly and well-disciplined atmosphere. Our modern accomodation provides the resources to support an experienced management team and highly qualified staff. We are committed to providing a high quality education, while making school an enjoyable experience for the children who attend Dronacharya Public School. Reference: Advertisement on THE Samaja newspaper Dated 28th May 2018.